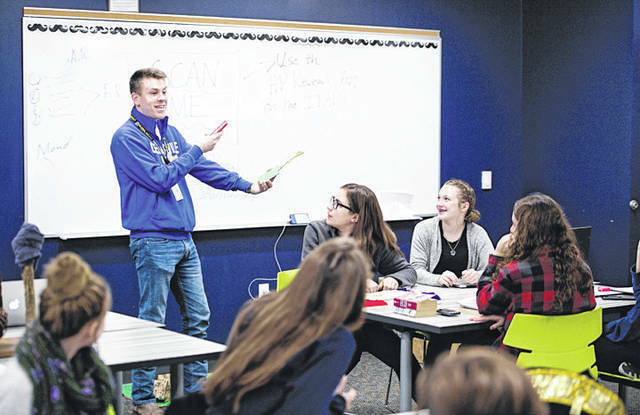 CEDARVILLE — World history is more than just a school subject to Brandon Williams, a Cedarville alumnus who teaches eighth grade world history at Global Impact STEM Academy in Springfield. It’s one big intricate story that shows how the lives and experiences of those before us have impacted the way that we live today. “Studying how a story is preserved and remembered is fascinating and I try to show my students that history is indeed leading somewhere and pointing to someone,” Williams said. To demonstrate to his students how history is more than just dates from long ago, Williams is transforming the way he teaches with the use of an augmented reality application called HP Reveal. The HP Reveal smartphone application allows individuals to enhance their natural environment with interactive images, videos, animations or audio files, making these digital elements look real on their smartphone screens. Through the app, students can transform their cafeteria on their smartphone screen. For instance, the nice lunch lady can have a fearsome T-Rex supervisor looking over her right shoulder. Williams decided to introduce the HP Reveal application to his students in 2018 so that they could create a virtual museum for the school’s Expo Night Dec. 13. The Expo Night allowed the students to share projects with the community that exhibit what they have been learning over the course of the semester. Each group of students in Williams’ class were assigned an event during the Age of Enlightenment to research and then bring to life using the HP Reveal app. “I’m not always in favor of putting students behind a screen to offer a personalized educational experience, but anything that can teach them a valuable skill set such as coding, content summary or making connections should be used,” Williams said. The students are learning valuable skills through this app and their augmented reality project as they are able to apply what they have learned in a collaborative and creative context. One group of students crafted a stop-motion video of the Battle of Lexington and Concord while others have used audio files and animations to display the content they have mastered. Williams and Global Impact STEM Academy plan to continue using the HP Reveal App for future projects and may use it for the school yearbook.